There is no shortage of programs available for addiction treatment. From traditional to complementary, these programs encompass a range of procedures and tools to help achieve and maintain addiction recovery. Likewise, yoga is increasingly being used as a natural treatment for alcohol and drug addiction. It can not only help one recover from the substance abuse but also helps prevents relapse and reduces withdrawal symptoms while providing a healthy outlet to cope with stressors and potential triggers. Yoga should be practiced in tandem with your major substance abuse treatment method, never as a replacement for clinical treatment. It is a holistic technique that brings mind, soul, and body closer through the use of meditation, exercise, and breathing. Yoga acts as a sort of natural medicine to boost your addiction recovery course. One of the great things about yoga is that it’s not only effective but it is also easy on your wallet. It doesn’t require expensive equipment or even a specific location. You can practice it pretty much anywhere and anytime you want. A 2013 study, conducted by Complementary Therapies in Medicine, suggests the prominent role of yoga in treating and preventing substance abuse. Meditation boosts self-control, which makes you more likely to avoid illicit substances such as drugs and alcohol. Drug addicts tend to face mental disorders, stress, and anxiety. Various yoga poses include breathing exercises that help alleviate symptoms of mental disorders. It also raises GABA levels, which reduce stress and anxiety. Controlling these factors is important to avoiding addiction relapse. Combining yoga and psychotherapy offers more benefits than conventional methadone treatment, even for severe drugs such as opioids and heroin. By addressing the mind and soul along with the body, you reap the rewards of a more comprehensive treatment plan. Drug or alcohol addiction negatively affects some pathways related to regulating things like emotions, decision-making, and pleasure in our brain. When someone with an addiction joins an addiction rehabilitation program, their brain chemistry, and circuitry heal and rebuild themselves to combat the influence of drugs and alcohol. Yoga enhances this healing process through relaxation and neurotransmitter regulation. Morning is the best time to do yoga. As your body collects energy for daily tasks, it prepares itself for regular triggers and stressors, helping you get back to a drug-free life. Check out the four best yoga poses that addicts should add to their routine. Remember don’t push yourself by trying difficult poses too early on. Start with simple poses, and once you gain confidence and flexibility, you can move to the advanced routine. This yoga pose boosts your confidence and prepares you for more complicated and beneficial poses. ☛Kneel on the floor with your knees pointing forward. You can put a pillow under your buttocks for comfort. ☛Relax, sit straight and keep your chest open. ☛Inhale and exhale slowly while keeping your eyes closed. You can join and hold your hands together in front of your chest. ☛Continue for a few minutes before moving to the next pose. Is there anything as peaceful as returning to a state of childlike innocence? Indulge yourself in the same innocence and peacefulness with child’s yoga pose. The child’s pose stretches your whole body and relieves you from the stress of adulthood. ☛Kneel down on the floor with a slight gap between your thighs. ☛Raise your hands upward and bring them forward slowly so that your palms touch the floor. ☛Keep the arms stretched out on the mat, and keep breathing naturally. ☛Stay in the pose and relax your muscles. Maintain the posture for a few minutes. 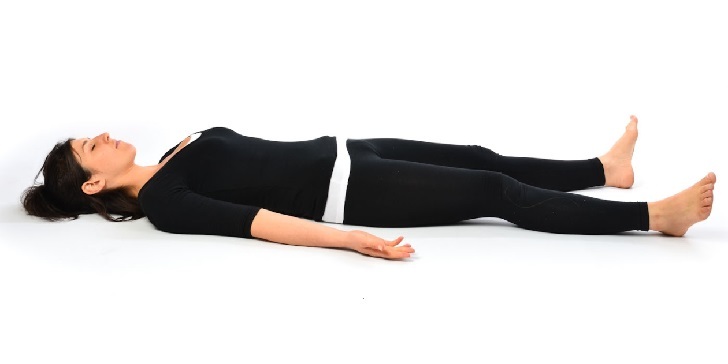 When you want to alleviate stress or mild depression, this super-easy and highly-effective corpse yoga pose will help. It lowers blood pressure, reduces fatigue and makes you filled with energy. ☛Lie straight on your yoga mat and keep your legs slightly apart. ☛Lay your palms facing upwards on each of your sides. ☛Breathe in through your nose and exhale through your mouth naturally and deeply while concentrating on your breaths. The camel pose releases pressure from the hips and shoulders. Philosophically, our body holds major pressure on these parts. The camel pose is a powerful way to let go of stress and worries replacing them with peace and healing. ☛Kneel down with your knees hip-distance apart. ☛Place your palms backward on your pelvis, with fingers pointing toward the floor. ☛Lean back, keeping your thighs perpendicular to the floor. ☛Rest your palms on your heels with your fingers pointing towards toes and thumb outside of each foot. ☛Drop your head back as long as it doesn’t strain your neck. ☛Maintain the pose for 30-60 seconds. Try this pose only if you’re confident and flexible enough. Important: If you have any medical issues, consult your physician or coordinator at drug and alcohol rehab before starting yoga exercises.